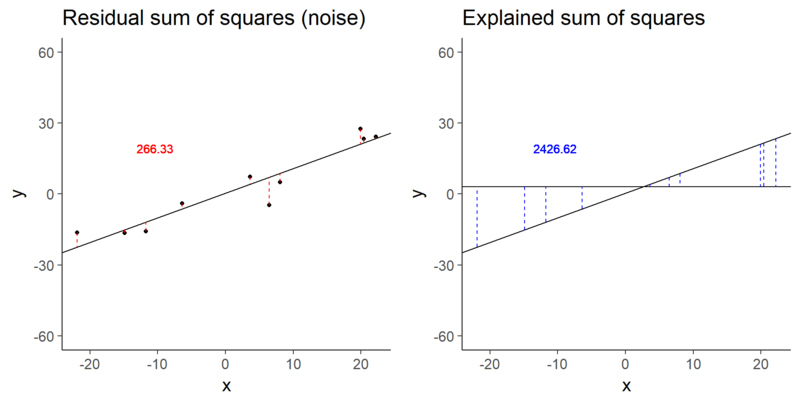 The goal is to provide some visualizations to help you understand linear models. Visualize boxplots of a gene that is clearly differentially expressed (a) and one that is unclear due to increased variance (b). 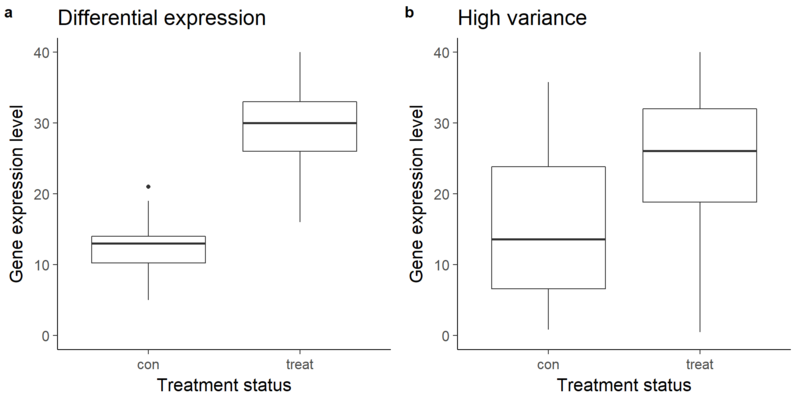 As you just visualized, differential expression describes the situation in which a gene has a different mean expression level between conditions. While some gene expression patterns are easily diagnosed as differential expression or not from a quick visualization, you also saw some examples that were more ambiguous. Furthermore, you need a method that is more robust than a quick visual inspection and also scales to thousands of genes. 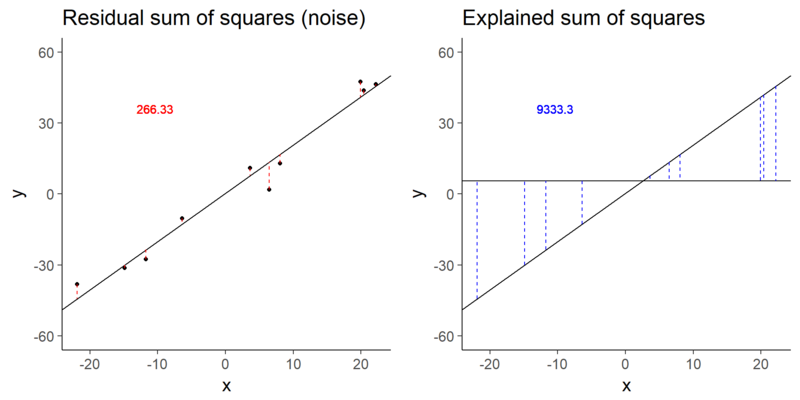 For this you will use the tools of statistical inference to determine if the difference in mean expression level is larger than that expected by chance. Specifically, you will use linear models to perform the hypothesis tests. Linear models are an ideal choice for genomics experiments because their flexibility and robustness to assumptions allow you to conveniently model data from various study designs and data sources. 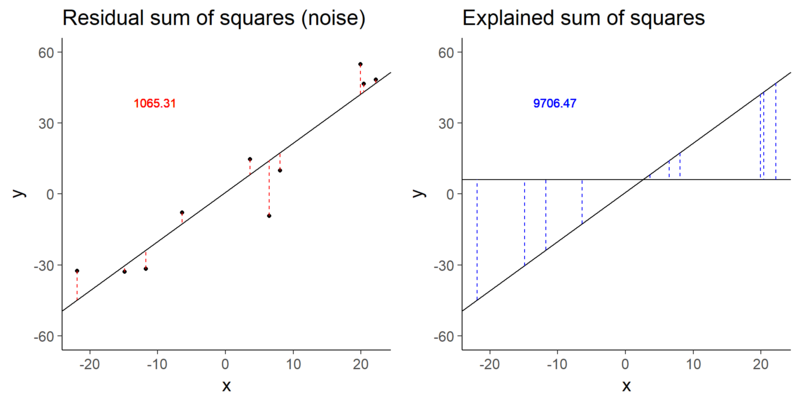 The simulation below demonstrates how the statistical significance of the computed F-statistic of a linear model is equally affected by the noise (the residual sum of squares) and the signal (the explained sum of squares). The baseline simulation has an F-statistic of 280.3557372. Doubling the error decreases the test statistic by a factor of 4. Similarly, halving the signal decreases the test statistic by a factor of 4.